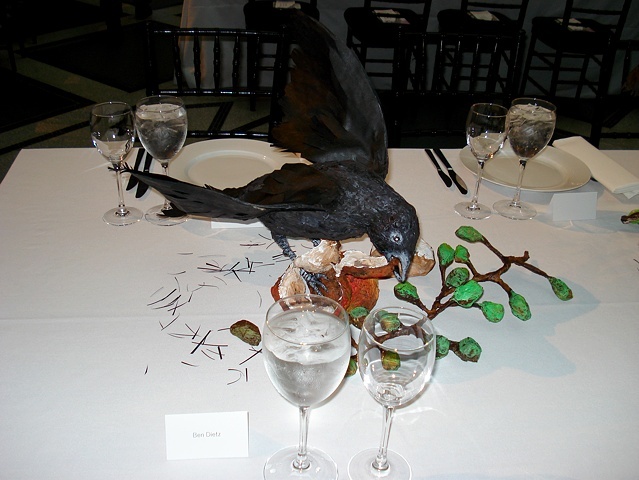 The Table by Valerie Hegarty consists of sculptural recreations of five still life paintings from the American Wing of the Brooklyn Museum. In addition Hegarty has created a flock of crows that are attacking and decimating the recreated still lives. Hegartys insertion of the flock of crows humorously plays on the genre of vanitas paintings, in which still lives contain objects that serve as symbolic reminders of life's impermanence (such as skulls, candles, or fruit showing signs of decay). Often depicted in literature and paintings as harbingers of death, the crows activate the still lives at the same time as they serve to demolish the tableau. The five still life paintings referenced are: Still Life with Peaches by Raphaelle Peale; Still Life with Cake also by Raphaelle Peale; Still Life, Fish by William Merritt Chase; Starfish by Marsden Hartley; and Pears and Oranges in a Bowl by William Glackens. The work was created from a combination of epoxy, paint, and paper-mache.